The plot of The Natural (1984) may seem like something only Hollywood could invent, but as they say, the truth is often stranger than fiction: On June 14, 1949, a crazed fan lured a pro baseball player to her hotel room and shot him, point-blank, in the chest. At first, 19-year-old Ruth Ann Steinhagen’s obsession with Philadelphia Phillies player Eddie Waitkus was your typical intense teenage infatuation—she had a little shrine to Waitkus in her bedroom and got the vapors the one time she managed to get close to him at a game. But there were signs that Steinhagen’s preoccupation was crossing into dangerous territory: She demanded that her mother set a place at the table for her favorite player every night, and taught herself how to speak Lithuanian, because his parents had emigrated from there. Unable to stand it any longer, Steinhagen bought a rifle at a pawn shop, then booked three nights at Chicago’s Edgewater Beach Hotel, where the team was staying. After watching the Phillies trounce the Cubs at Wrigley Field, she went back to the hotel and paid a bellhop $5 to leave a note in Waitkus’s room. “It's extremely important that I see you as soon as possible. We're not acquainted, but I have something of importance to speak to you about. 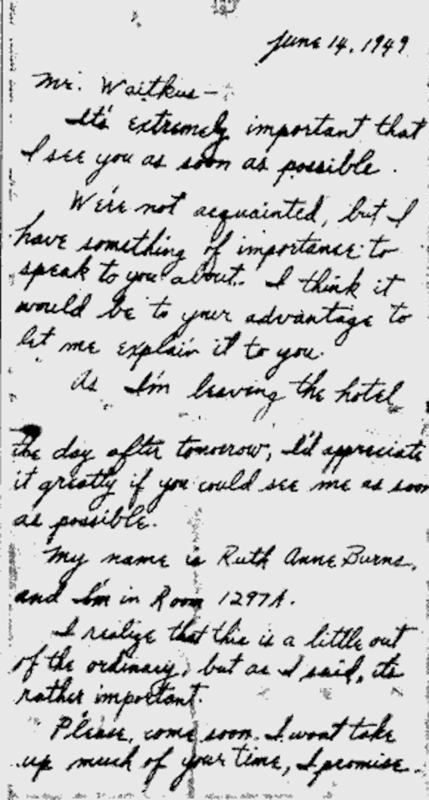 I think it would be to your advantage to let me explain it to you.” She provided a false name and her room number, and asked him to come as soon as possible. Waitkus barely had time to ask what was going on before Steinhagen shot him. And then she comforted him, placing her hand over his and asking him where he had been hurt. Though Steinhagen had intended to commit suicide after killing her idol, instead, she called the hotel operator and reported her crime. Waitkus’s right lung had collapsed; he required two blood transfusions and six operations, but he survived. When police brought his shooter to his hospital room for identification, he asked her why she did it. “I’m not sure,” she replied. Steinhagen apologized at the trial and said she was still as in love with him as ever. “I have no compassion for her,” Waitkus said. “Furthermore, she ruined a $60 suit by shooting me through the coat.” A judge determined that the teen was insane; she was sent to Illinois's Kankakee State Hospital, where she underwent electroconvulsive therapy. After 33 months, she was deemed cured and released. Waitkus could have pressed charges once his would-be killer was declared sane, but he declined. Sadly, though Waitkus survived the incident and even went on to play several more seasons of baseball, he still died young—he was just 53 when he succumbed to esophageal cancer in 1972. Ruth Ann Steinhagen survived him by 40 years, dying in 2012. The incident inspired author Bernard Malamud to write The Natural in 1952; it was made into a film starring Robert Redford and Glenn Close in 1984.